After the stunning success of Carmina Burana in 1937 Orff took scissors to his past and insisted that henceforth it should be known as his Op.1. He made only one exception, allowing his own settings of Monteverdi to be performed � the Lamento dell�Arianna and Ballo dell�Ingrate. Orff augmented his orchestra with two basset-horns and three double strung lutes and it�s in this manner that Orff pays some noble homage to the stile espressivo of Monteverdi. The Lament of Ariadne (Lamento dell�Arianna) is a surviving operatic fragment and written for Mantua. It was followed a week later by the Ballo dell�Ingrate, though this was destined for a wedding feast. In this way Orff constructs the laments and Ballo in an arc from despair to light. These 1974 recordings were conducted by Kurt Eichorn and supervised by Orff in what we can suppose are pretty much definitive performances as to his intentions with regard to the orchestral colour, the vocal stresses and the emotive temperature. 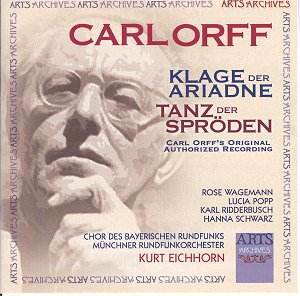 The German text of Klage der Ariadne is by Orff himself and the companion work has a free realisation by his colleague at the Munich school of dancing in the 1920s, Dorothée Günther. The apportioning of the roles is well nigh perfect but even amongst the stellar quartet it�s perhaps nowadays the least well remembered, Rose Wagemann, who makes the most moving impression � and not simply because she bears the emotive burden of the Lament of Ariadne on her own. Centred and dramatic hers is a voice that commands immediate admiration. Her voice suits Orff�s frankly romanticised declamation with remarkable precision and she makes a cumulatively moving impression � allied to which the voice is beautiful. The most intense point is Träume, selige Träume where Orff�s bass accents and stark romanticism conjure up the shade of Monteverdi without either pastiche or reinvention. The auburn hued instrumental string passage in Hört, werte Damen, part of the Tanz der Spröden, breaks up the recitative in a peculiarly impressive way. Ridderbusch sings with gravity, depth and dignity though it�s the passage Wie unerträglich anzusehn, that devoutly entwined arioso, where the bass reveals his strengths in melismatic singing. Later on, in the dance, we hear the pizzicati and harp and lute sonorities that are part of Orff�s rich instrumental tapestry � rich but certainly not glutinous. The chorus has its moment late in the work � the engineers recess its sound deliberately to give an impression of spatial separateness. We also hear the clear, immaculate Lucia Popp as Amor and the spinto mezzo of Hanna Schwarz. The restoration sounds excellent; it has used that much touted 24 bit � 96 kHz system. Notes are in German, English, French and Italian � the texts are in German only. This forms part of the Orff series on Arts; the timing is short and in the context of the composer�s development it may not seem an essential purchase. But it�s finely done, rewarding � and moving.